Officers and men from the Kaduna State Police Command, weekend, aborted a lecture on corruption earlier billed to take place at the Kagoro Town Hall, in southern Kaduna. 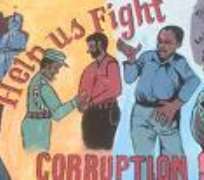 “The action of the police is a clear indication that those in government are not sincere with the fight against corruption,” said one of the invited speakers and National Secretary of Action Congress (AC), Dr. Usman Bugaje. Prof. Sam Egwu, a lecturer at the Kogi State University, Ayangba. Police Division Officer in the area, I. Attahiru, who led a team of policemen, had arrived the venue at about 8.00am in an ALGON jeep with registration number NPF 2659 B and a Hilux van from the Kaduna State security outfit, Operation Yaki, with registration number AG 271 KRA and Code 001 and sealed off the hall. Bugaje said, “Whoever stopped the event must have done so because they do not want us to expose their corruption. Whoever is stopping it is corrupt and do not want corruption to stop. “Whatever they want to tell anybody now will not hold water because this is a very strong message that the citizens cannot even speak about corruption,” he added.